I can’t get a read on Bryce Harper. He’s both one of the top two prospects in baseball and an 18-year-old kid. He’s an accomplished and talented phenom, but also a raw and developing minor leaguer. He could be ready for the big leagues now, or he might need a full year in the bushes first. He may be a soft-spoken, humble talent, or he just may be a cocky, arrogant superstar-in-the-making. And though those two descriptions may be on opposite sides of the spectrum, they’re not necessarily good vs. bad. When you’re as good as Harper is, you’ve got to have a level of cockiness and arrogance. I spent two days — Friday (along with SportsAngle) and Saturday — arriving at FirstEnergy Park in Lakewood hours before first pitch. I watched Harper take batting practice, hearing the fans calling for autographs by the third-base dugout. For the first few innings of each game, I shot photos from the ends of the dugouts before taking in the rest of the ballgame from the press box. And after each contest — both wins by Harper and the Hagerstown Suns — I waited in the press box for Bryan Holland, the Suns’ broadcaster and media relations guy, to wrap up his broadcast so he could lead the media throng down to the clubhouse for Harper’s postgame interview. OK, so that’s a little different — an 18-year-old Class A outfielder has his postgame press conferences regulated, with help from the team’s media coordinator. But that’s not on Harper; it’s the Washington Nationals who are trying their best to script Harper’s development in the minor leagues, balancing his on-field progression with the media’s desire for access. In some ways, I think they’re being a little overprotective — pre- and postgame interviews are part of baseball, and the earlier he gets used to that, the more comfortable he’ll be with it. But maybe they’ll ease up on the restrictions as he progresses through the organization. He is, after all, only six weeks into his first professional season. His childhood friends and middle school classmates are currently — as nearly every story on Harper mentions — getting ready for their senior proms and high school graduations. There will be plenty of time for interviews. But we still had access to Harper after each game, despite being told he’d only be available if he played a part in the outcome. That definition was stretched on Friday night, when his infield dribbler served to extend his hitting streak to 17 games — but was followed by Harper getting picked off first base on a steal attempt. Hagerstown won, 4-3, but Harper’s contributions added up to zero runs created. And though asked to keep our questions limited to what happened in the game, we were able to expand into more general queries without reprimand. In the end, it certainly wasn’t your usual postgame in the South Atlantic League. We both looked over and spotted the black jersey with No. 34 on the back at the same time. Sporting orange-and-black UnderArmour cleats, Harper had a helmet on and bat in hand. “Aaaand he is,” Brown said. “I’m going to go see how many [staff] we have at the gates.” With that, Brown bounded up the steps to the concourse. A few minutes later, the fans started streaming down the steps to either side of the Hagerstown dugout — the gates had opened 10 minutes earlier than originally planned, all because of the 18-year-old in the batting cage. Following BP, the Hagerstown players went out to their positions for fielding drills before returning to the dugout — where the calls for Harper to sign grew louder. 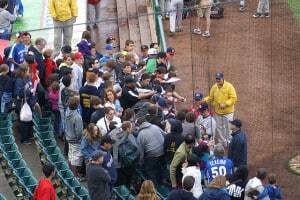 He obliged, entering the dugout via the ramp beyond third base and making his way along the outstretched hands holding baseballs, photos, posters, pens and Sharpies. He couldn’t accommodate everyone, but he got to many, even backtracking when a father called out that a young girl had been missed. About half an hour before first pitch, the Suns began returning to the dugout. They’d changed from their black-and-orange batting practice attire into their red-and-blue alternate uniforms. Harper emerged from the tunnel with his pants cuffs pulled down to his shoetops, a change from the “high-sock” look he sported during BP, and without the orange-and-black shoes. Instead, he wore blue-and-white kicks that matched the uniform. A fan who had been first to the end of the dugout nearest the tunnel and bat rack held out a supersized print of Harper’s Sports Illustrated cover. “Bryce!” he called out. “I’ve been here for four hours. Please sign!” Harper obliged before heading out to the field for more stretching, loosening and throwing. There was one more task to come before first pitch. In high school and his one year of college ball, Harper was recognized for using his eye black as war paint. On the day they drafted him, however, the Nationals were quick to make clear that such liberal application of eye black would not be permitted. I hadn’t noticed that Harper had gone through BP and warmups without any eye black on, so that was still to come. Down in the dugout, he had a teammate hold up a pair of sunglasses while Harper applied the eye black to his cheeks, checking his progress in the sunglasses’ reflective lenses. (Be sure to check out SportsAngle’s video of this ritual.) Once he had the bulk of it applied, a trainer touched it up, ensuring that it was even — and nice and thick. Batting third in the order, Harper strode to the plate with two outs in the first inning, announced as the IHOP Strikeout Player of the Game — just one whiff on the night would win each fan in attendance a coupon for 20 percent off their next visit to the IHOP in Brick (down on the dark side of Route 88). 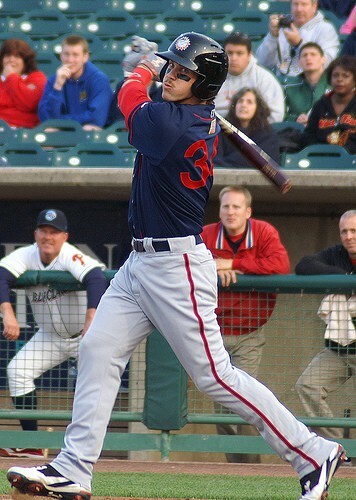 BlueClaws starter Jesse Biddle obliged, getting Harper looking. After the game, Harper was asked about the designation. “I hope I get a voucher, too,” he said with a chuckle. Sure enough, before Saturday’s game, a BlueClaws staffer waited by the dugout as Harper applied his eye black for the evening, then handed him a bright orange coupon, good for 20 percent off — and the Suns had two more games to play in Lakewood before heading home. They return June 12-15, but there’s no telling if Harper will be with them. From that point, Friday was a relatively quiet night. Other than the aforementioned dribbler that extended the hitting streak, Harper made four putouts in right field and played three base hits. After the game, he stood before about 10 reporters in his black undershirt and black Suns BP cap and answered questions for about seven minutes. His varied responses made him at times sound like the mature-beyond-his-years rookie described by his coaches, at others like the green teenager he still is. One reason he comes across so maturely is that, other than his salary, playing day after day after day and the various Sally League ballparks he’s appearing in, not much is new to Harper. In his year at the College of Southern Nevada, he endured long bus rides similar to what he’s facing when Hagerstown heads up to Lakewood (a short trip) or down to Rome, Ga. (considerably longer). After the first game in Lakewood, where 8,217 people turned out for Harper (OK, and Fireworks Night), I asked him about playing in front of such a big crowd. I arrived at the park a little later on Saturday and went down to the Suns’ clubhouse to talk to Michalak a little more. The tarp was on the field and rain fell intermittently, forcing BP indoors. Michalak had just made himself a cup of soup when I arrived and Harper stepped away from the food table and around the wall where the lockers are. Later, as I descended the stairs from the suite level to head down to the field before the game, Harper was a few steps ahead of me, walking alone, bats and glove in hand. I saw what he saw as his metal spikes clacked on the concrete on his walk toward the dugout. Beyond the doors, fans leaned over the railing, hoping that the footsteps they heard were Harper’s. Had I held my camera in my hand, it would’ve made for a dramatic photo — the dark tunnel, the light at the end, the fans leaning over, the No. 34 on Harper’s back in shadow. When he emerged into the dugout, the fans burst forth with their cries. “Bryce! I’ve been here for five hours!” one yelled. Perhaps it was the four-hour guy from Friday, hoping an extra hour might result in another autograph. The pregame routine was much the same on this day — stretching, jogging, throwing, signing. Only the eye-black application was slightly different, with an assistant applying it from the start, instead of Harper handling the initial application. 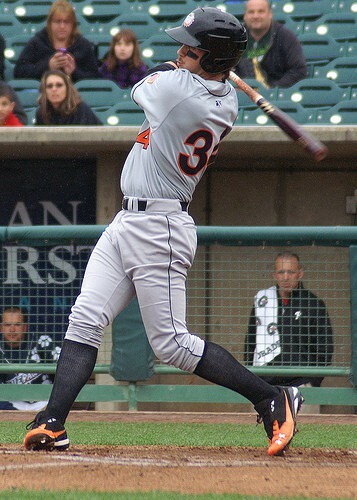 And the uniform was different — Hagerstown wore its traditional road grays, orange lettering with black outlines, and black caps. Harper wore his pants high, exposing the black socks, and once again sporting the noticable orange-and-black shoes he had donned in BP on Friday. Shortly after receiving his voucher for IHOP and stashing it in the cubby hole that housed his helmet, Harper strode to the plate as the Casino Pier Strikeout Player of the Game — and immediately went down swinging. He did the same in his second at-bat before coming up to lead off the top of the seventh in a 0-0 game. This time, he connected on the first pitch and sent a line drive over the fence in left field onto the grassy berm. His sprint around the bases — this was no trot — took all of 17 or 18 seconds (I’m no Tater Trot Tracker). A single in the ninth made for a 2-for-4 afternoon, and Harper capped the game by catching the final out on a fly ball off the bat of Stephen Batts. Saturday’s postgame interview came after a longer wait, and this time Harper appeared after his shower, wearing a striped light blue golf shirt and mesh ballcap (on backwards). Again, some answers showed both a young player still finding his footing, while others made you wonder how much time he had for his schoolwork considering how much he knows about the game. I have to say, even I wouldn’t have been able to tell you how Pete Rose circled the bases on a home run. I mean, I know he was Charlie Hustle and ran out everything, and now that his name has come up, I can picture him running out a home run, but he wouldn’t have been the player on my mind when talking about hustling home run trots. Despite all that — getting as much access as anyone, asking the same questions of Harper, Daubach and Anderson and hearing the answers as they did — I didn’t come away from the weekend with a feeling for Harper beyond the ballplayer. That’s unusual for me; I tend to have some first impression that goes beyond what I’ve come up with going in after watching a guy on TV and reading about him in other outlets. That may be because I didn’t have nearly as much background on Harper as I would for a more established player. Or it may be that he gave off different vibes with different answers and actions. At times, he sounded a lot like the 19-to-21-year-olds who come through the South Atlantic League. At others, he sounded like the uber-talented phenom that he knows he is. But, hey, that’s to be expected, right? Didn’t you know the guy should be getting ready for his prom instead of crushing the Sally League? 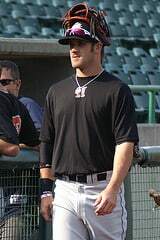 If I came away with anything, it’s that the Bryce Harper who we all expect to take the National League by storm in 2012 (I’m among those who doesn’t think it will happen this year under any circumstances) isn’t there yet on that Hagerstown bus or buttoning up that No. 34. But he’s emerging.